After inspiring Think Tanks we found our subject for this summer. 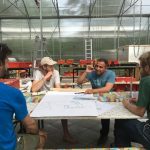 We want to support the “Bildungsmanufaktur” of S27 building a kitchen with Low Tech Water Treatment. For the Day of Care, 19th of June, with Scansonic, we will start with a watertower which will supply the kitchen with water generated out of rainwater. Next Think Tank on 29th of May – please sign in, if you want to come. Previous PostLet the water flow!